This apartment was clean, attractive and was well equipped. Despite the cold April weather the flat was warm (although electricity is an additional cost as stated). 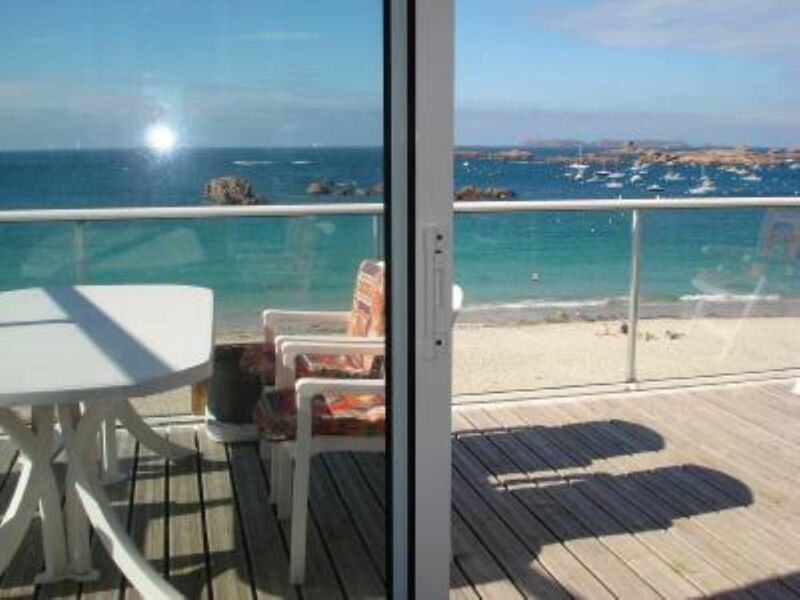 The view from the room and balcony is directly over the beach with it’s pink granite boulders - amazing in all weathers. The owner was very friendly and helpful. The apartment has its own alllocated place on the car park which is very useful. Location: Coastal walk straight from apartment. Very nice restaurant very close by. Easy walk to the small town with mini supermarket, patisseries etc. Had a wonderful week and would like to return sometime. Merci beaucoup pour votre appréciation. Je suis ravie que vous ayez passé un bon séjour et c'est avec plaisir que nous vous accueillerons de nouveau dans notre belle région. "My wife and I had a very pleasant holiday in Tregastel. We have visited this area several times before with our children, but this was the first time on our own. The Granite Coast is a very special place. The coastline and beaches are fantastic. The weather is unpredictable, but being British we are used to that and did not deter us from exploring the area on foot. We particularly enjoyed the boat trip to see the gannet colony. What amazing birds they are, and you can see them gliding effortlessly over the waves out to sea from the apartment balcony. Seeing puffins flying over the boat was also very special. The apartment exceeded our expectations. It was even better than the photographs conveyed. Great location right on the beach, lovely big balcony, very clean and modern with excellent facilities and easy private parking. We could not fault the apartment or it''s location. A couple of very minor comments. We found it slightly old fashioned having to read the electricity and water meters at the beginning and end of our stay and working out the amount before we left. We would happily pay a bit more rent. Also in this computer /internet age it would have been very useful to have WIFI in the apartment. I have no doubt we will return to this lovely apartment and I will make more of an effort to learn some French. Tout correspond à l'offre. Un charme fou, le ressac à quelques mètres. Un calme absolu le soir et un bon resto à quelques mètres, que demander de plus ? Nous recommandons vivement. Et puis la GRANDE terrasse sublime pour les petits déjeuners et les diners ...un vrai spectacle de la mer ..et du soleil. Bref nous avons adoré et nous aurions bien voulu continuer notre séjour une semaine de plus, hélas il était loué;;; mais nous espérons revenir très bientôt . Je vous remercie pour votre appréciation, cela m'a fait énormément plaisir. C'est avec joie que nous vous accueillerons une prochaine fois. Super Lage, prima Aussicht, schöne Wanderwege, nahe Einkaufsmöglichkeiten. Wohnung in sehr gutem Zustand mit Komplettausstattung, wunderbarem Balkon, großem Parkplatz einmaligem Strand. Je vous remercie pour votre commentaire et je suis ravie que vous ayez passé un agréable séjour. Schöne Ferienwohnung in der 2. Etage eines Hauses direkt am Greve Blanche. Unbeschreiblich ist der Ausblick vom großen Balkon. Dieser ist rundum verglast, hat Morgensonne und am Abend kann man den Sonnenuntergang genießen. Während unseres Aufenthaltes gab es ein Problem mit dem Internet. Die Vermieterin hat sich persönlich darum gekümmert, dass es wieder läuft - Danke nochmals dafür! (Text automatically translated) - Water Activities: heated seawater with sauna and hammam space relaxation, fishing, boating club, canoeing, diving, thalassotherapy. - Outdoor activities: golf, mini-golf, horse riding, mountain biking or hiking, tennis ... - Other activities: bowling, cinema, casino, nightclub.